Fab card Sylvie and a great image to fit the song......you cant beat the 1960's songs can you....oooppps showing my age now..lOl..lOl. Well done on winning the treasure hunt! I love this image - it's superb! Fab colouring too. I did giggle at your 'nipping under a tree' and the boys spying you both!! And why not! Gorgeous card Sylvie youve coloured him so beautifully! "Wild Thing...you make my heart sing" I used to love that song. I'm digressing, Sylvie. I love your card that so goes with the song. That PB image is brilliant for guy cards. Well done for winning the treasure hunt. And I loved your story, it really made me smile...I could picture everything LOL! It reminded me of when I once had to have a scan. I had to have a full bladder and drink a lot of water. We had an empty vodka bottle, so I filled it with water. On the way there we stopped at some traffic lights and I took quite a long drink, when I looked to my left, there was a bus load of people watching me. They must have thought I was an alcoholic - lol! This is such a great card! 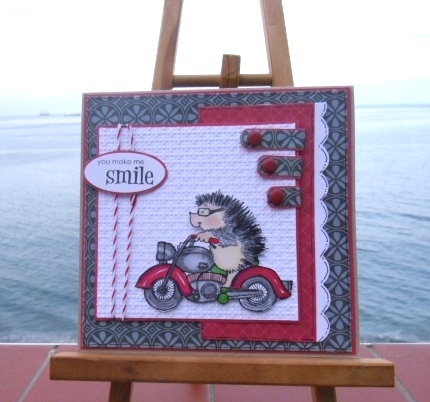 I love your stamped image and your colouring in is fantastic! Thanks for joining us at Freshly Made Sketches this week! Fabulous card Sylvie - love the image!! Ooh, I can just imagine what those boys thought, lol! Oh how fun he is!! Love your take on the sketch. Glad you joined us at Freshly Made Sketches! Oh this is brilliant Sylvie, perfect for mans card too. My email I have just sent to you makes sense now!! I thought you were considering buying the stamp .. .. not that you had the little beauty already! You have used it beautifully here .. .. and I doubt I would be able to make it look any more attractive than you have here. Fabby layout and backing papers and brilliant colouring. What more could you want. Your picnic story made me smile. LOVE it! Hedgehogs just make me happy for some reason. :) Thanks for joining us at Freshly Made Sketches this week! Very funny card! i love this stamp, great colouring and funny story:D.
This is so cute Sylvie - wonderful design. Sometimes I get so very behind in my blog snooping!!! !